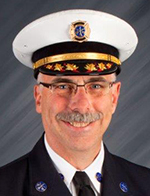 Southfield Fire Department Battalion Chief Barry White has been selected as the acting fire chief by the city. White has been with the Southfield Fire Department for nearly 30 years, beginning in 1986 as a firefighter. He has served in progressively-responsible supervisory positions throughout the department, including as an EMT/paramedic, lieutenant, line captain, and as the department’s training and safety officer. He is a founding member of Michigan Urban Search and Rescue Task Force and the Oakland County Incident Management Team. White is a graduate of Eastern Michigan University’s School of Staff and Command, the National Fire Academy and Southfield High School.